I was shocked. The sound from these top of these line JBL headphones, when using the supplied custom audio cable, was — disappointing, to be diplomatic. How about wireless Bluetooth (BT) audio from my iPhone and iPad? Much better! Whew. I took a deep breath and turned on JBL’s Active Noise Cancelling (ANC) feature. Surprise! Very good audio performance, explosive presence to the music, and effective isolation from external noises. Let’s go through our check list to examine every feature of these new Everest Elite 750NC Wireless Over Ear Noise Cancelling Headphones. 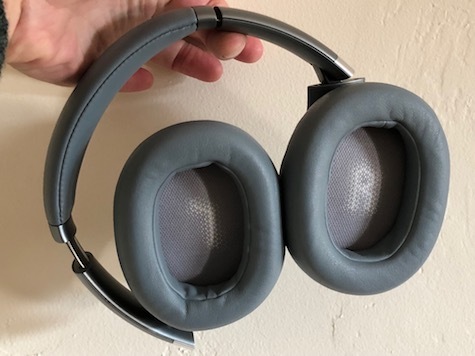 Styling and design are semi space age on the gray and silver headphones provided for our review. R and L are conveniently marked inside the right and left earpieces. These ear units fold inward and swivel 90 degrees for travel and storage in an included excellent zippered case. Build quality and materials are robust without being overbuilt or massive. Overall weight is moderate. The feel of the brushed polycarbonate and leatherette padding is gentle on the hands, head, and ears. Earpiece controls and buttons are all on the edges of the outer segment of the right ear unit. You’ll be perplexed and annoyed with them for a few days until you master what’s what: power, volume/track advance, play/pause/phone controls, Bluetooth, and a custom button described below. Bluetooth connections to your playback gear, such as iPhone and iPad, are easy to set up. Battery and charging work as advertised, requiring three hours for a full charge that will play up to fifteen hours depending upon volume of playback and ANC features used. Head comfort and fit are very good on my bald and smallish noggin. Ratcheting extensions add over an inch on each side for listeners with large head or abundant hair. The padded headband and ear cups are just right comfy without any gripping or flopping. Fit is snug enough that even without any music playing and these headphones turned off there is a surprisingly efficient passive sound reduction from noises in the outside world. 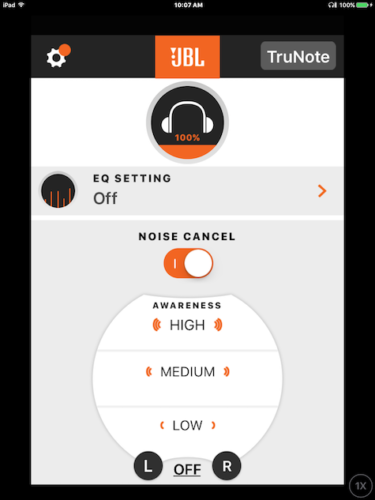 Custom My JBL Headphones iOS app is a wonder of app design and functionality. It has only a few features, and each one is easy to understand and use by semi-technical music fans. Modify the equalization (EQ) — piece of cake. Adjust the intensity of noise reduction relative to the music being played and the sound in the real world — quick and obvious. 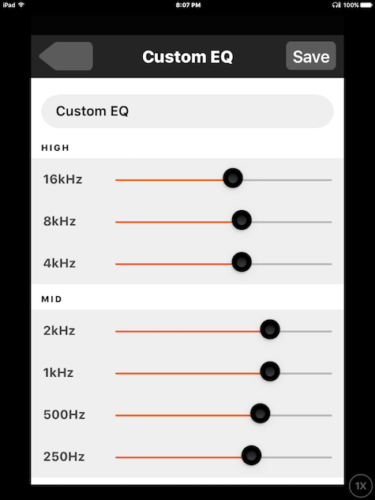 Turn Noise Cancel and EQ off and on again to compare different soundscapes — straightforward. 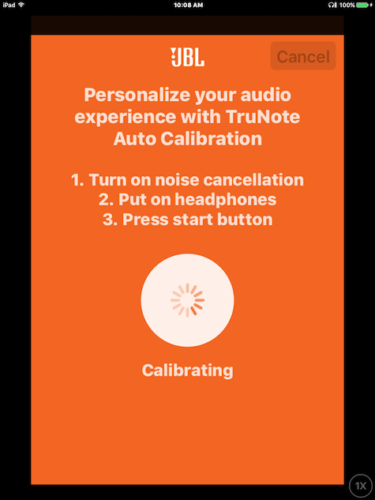 Tune TruNote Auto Calibration to your specific ears — beep and it’s done. With ANC switched on and EQ set to your preferred sound profile, you are in for an immersive treat. There is no audible hiss or white noise when the Noise Cancel Awareness is set to OFF or LOW. Hiss increases but does not intrude at MEDIUM and HIGH settings, the latter allowing for maximum ambient audible sound, independent of the music’s volume and clarity. This Awareness feature needs to be experienced to be appreciated. 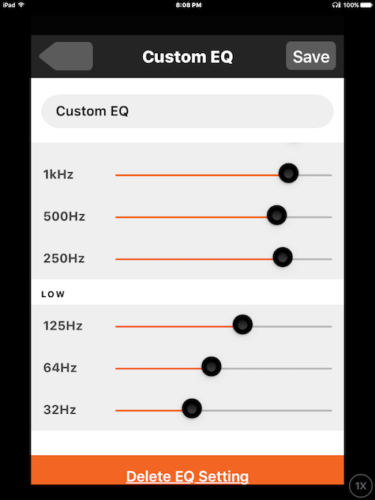 Real engineers and app designers combined forces to develop a listening and iOS app unlike any of the quirky and less than useful audio utility apps I’ve tested before this one. Custom Smart Button cycles through the Awareness modes (skipping MEDIUM for some unknown reason) without the user needing to pull the iPhone out of a pocket or purse. Printed Quick Start Guide, with line diagrams and multi-language text description that is so small to be unreadable, gets the job done, but you’ll do just as well figuring out how everything works without needing a magnifying glass. Hey, JBL! For $300 give us a real manual, not this optical exam. 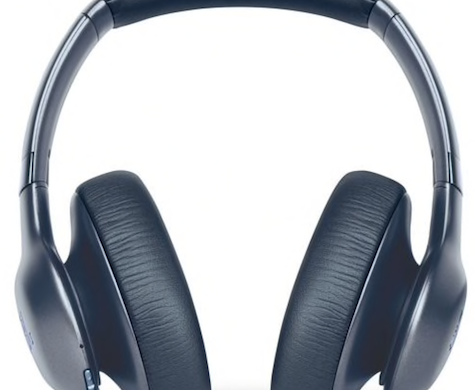 Wired cable connection to audio source allows the listener to use ANC if the battery has any charge, but most people will go full wireless for the optimum experience with these Everest Elite 750NC Wireless Over Ear Noise Cancelling Headphones. There is a beautiful, gentle classic country-rock song, Deep, Dark and Dreamless, by The Souther-Hillman-Furay Band, that displays the vocal chops of the headphones. Lead and backup singers are solid in the center listening zone, surrounded by emphatic instruments to the left and right. 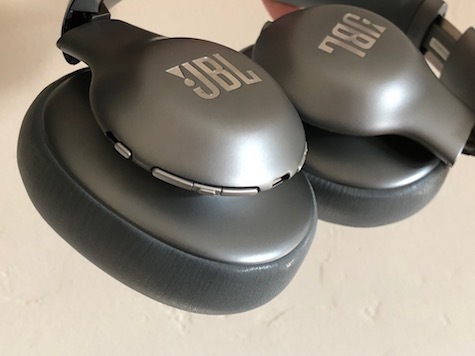 These JBL headphones are not audiophile quality, but they are superior for recreational listening, especially with popular music, and also definitely in a noisy environment. Another gorgeous track, Sweet Lover of Mine, by Emily Smith, is great for testing the clarity of instrumental accompaniment along with her remarkable voice. Bass presence is firm without being squishy or obnoxious. Flute solos are lyrical and not piercing. Vocal echo effects are gentle and spacious. Again, sonic articulation is not world class, but the ability to tweak EQ on the fly makes up for most deficiencies. Tsimtsum is a rich instrumental and choir composition from the movie soundtrack, Life of Pi. The wooden flute at the halfway point in this short piece is organic and raw. The blend of the strings and the sung chords is a dense and affecting combination, even with Awareness on high with maximum white noise. Musical parts are somewhat bunched together in these JBL’s playback, in a clustered and unified effect, as opposed to individual details in other high-end headphones. Leonard Cohen’s song Dance Me To The End Of Love gets full treatment in the version by Nikos Aliagas & Friends. The band is super tight and the bass pounds just enough to get me dancing around the living room. You will definitely want to tune your EQ for best clarity until you find its sweet spot; multiple custom EQs are available. Two of my favorite test tracks that feature stellar recording technique may not be preferred listening material for some of you, but they really exhibit the strengths and weaknesses of headphones. The balanced sonic synth explosion that is Kesha’s Die Young comes forward in all its glory from these headphones in Bluetooth mode with Awareness OFF and EQ customized for my audio taste buds. And Bob Dylan’s bizarre Gonna Change My Way of Thinking duet with Mavis Staples, from an album entitled The Gospel Songs of Bob Dylan, features Bob’s band at its bluesy rocking best, with his croaking vocals in duet with Mavis’ soulful delivery. Percussion, guitars, bass, and singers unite in a gospel rock gem that is beyond my ability to describe. 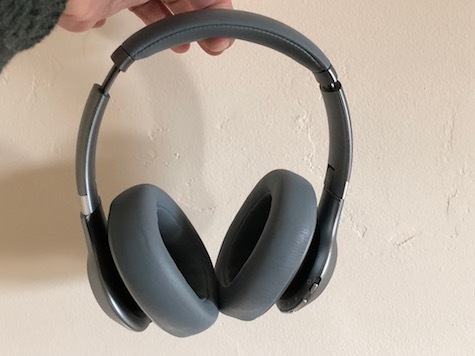 On a 10 point scale, Everest Elite 750NC Wireless Over Ear Noise Cancelling Headphones produce sound that is roughly 7 for everyone except the most intense audiophile. Comfort gets a 9, but the right side controls only get a 6. 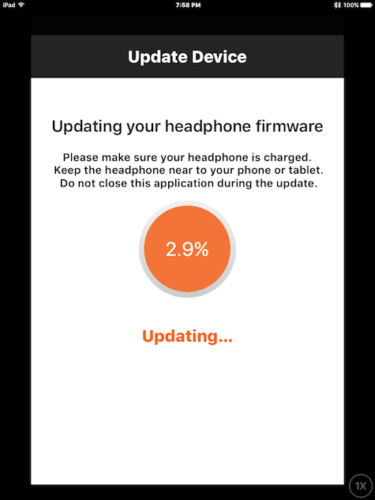 Active Noise Cancellation and equalization in the excellent My JBL Headphones app each rate a 9. Our overall MyMac Review Rating is 8 out of 10.